Spring has gotten us in the mood for coconut cake. So I decided to try my hand at making coconut whoopie pies. The cake isn't all that soft and delicate--more like quick bread. However, this seems to make it more suitable for the task at hand. This filling has a fluffy texture and has both the body and stickiness to hold the cake sandwiches together. I posted picture-ridden instructions for these cakes on Instructables and it was featured! 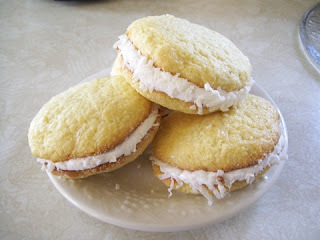 If you want to see the tutorial, it can be found here: Instructables Coconut Whoopie Pie. In a large bowl, combine dry ingredients (flour, sugar, baking powder, salt, and coconut). In a small bowl, whisk together egg, milk, oil, and coconut extract. Pour liquids into dry ingredients and beat until combined. Using a cookie scoop, drop 2 inches apart onto greased cookie sheets and bake for 7-9 minutes or until cakes spring back when touched. Remove with a spatula and cool on racks. To prepare icing, combine egg white, sugar, corn syrup, water, cream of tartar, and salt in a double boiler over boiling water. Beat with mixer until mixture is firm and forms peaks. Remove from heat and fold in coconut extract. Pair up cakes and fill with about 1-2 Tbsp filling, pushing together to spread it. Sprinkle edges with shredded coconut. Makes about 20. Seriously, these are really good.